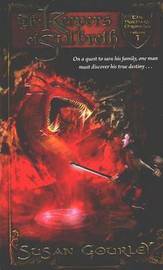 In this magical, medieval fantasy, forces must combine to save the kingdom of Futhark from the evil abyss that threatens it. Sitting within this land and high above an unexplored sea is Sulbreth, the seat from which the Otten family has always ruled. Standing next to their throne are the Keepers, gifted sorcerers who hide a guarded truth only the king understands. When Prince Jonared takes the throne, he also inherits a tragic and dark shadow ready to befall his land. He and the Keepers summon Sabelline Shelton, a rare sorceress gifted in metallurgy, for a duty she has always feared. But even her exceptional talents are not enough to forestall the soulless enemy issuing forth from the dark places of Futhark. When Cage Stone enters Sulbreth in a tournament to secure his sister's future, he too is called by a prophetic destiny to help fight the otherworldly foes and renew the seals that protect their kingdom. Susan Gourley is a novelist, a teacher, and a coach. She lives in Hummelstown, Pennsylvania.